Baptism is a happy funeral. 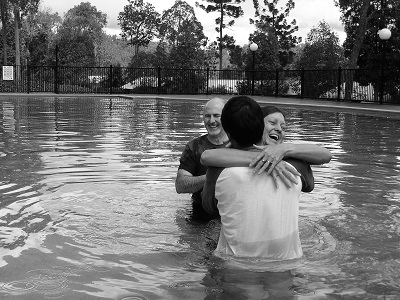 The Bible does not say that baptism is required for salvation, but it is important. When we receive salvation through the blood of Jesus, we are born again. Therefore, if anyone is in Christ, he is a new creation; old things have passed away; behold, all things have become new. (2Cor 5:17) We start a new life. Our old life is dead, and we begin a new life in a new kingdom. Baptism is our acknowledgement of our death. It’s a funeral Or do you not know that as many of us as were baptized into Christ Jesus were baptized into His death? (Rom 6:3) But it’s a happy funeral. All the old things that harassed us and hurt us in the past are put under the blood for Jesus to manage for us. He’s so much better at it than we are! If you have not been baptized, it’s not too late. Make it your celebration of your life in Christ. It’s your acknowledgement that you belong to Jesus and are a proud card-carrying citizen of the kingdom of God. You’ll be amazed at the blessing that follows that act of love. This entry was posted in Blog, Kingdom of God on December 3, 2013 by Diana Symons.